Welcome! My name is Camie and this is my cozy corner where I share a little of myself and my faith with the world. My hobbies include crafting and photography. I enjoy reading, journaling, and sometimes I dabble in poetry. I am a devoted member of The Church of Jesus Christ of Latter-day Saints. I love my Savior, Jesus Christ, and I love being a daughter of God. I’ve been married to my wonderful husband for twenty-six years. We have three adult kids now in college, working or serving a mission (they are the three on the very left in the photo above). I homeschool my baby, a son who is fifteen and we have been homeschooling since he was six-years old. 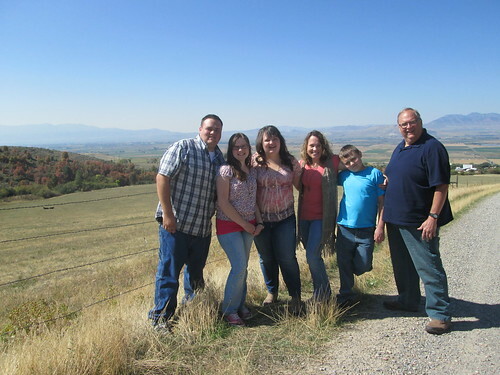 We are a close family and have moved around, living in Washington, Utah, Arizona, Canada (Ontario) and Peru (twice!). Lovely family – that’s what life is all about. I have five myself, all grown up now with families of their own. One lives in Hong Kong otherwise all the rest are nearby. I am blessed. Yes, you are blessed! Have you ever visited your loved ones in Hong Kong? No visits..hubby not well enough to fly that long, 16 hours….but we skype often. Wow, USA, Peru, and Canada?! Interesting combination of places you’ve lived! Yes, it is an interesting combo! Definitely not planned, LOL.